Another hunting photo, another fit of celebrity-led social media outrage. Clamouring for a ban on trophy hunting from the comfort of their wealthy, urban armchairs, none understand the consequences of what they so loudly demand. Let’s consider what would happen. On 7 September 2018, for reasons that elude me, the Safari Club International (SCI), a US hunting association, added a photo to their gallery. It depicted a hunter, known only as Britany L, proudly displaying a remarkably large leopard kill. Nothing further is known about the hunt. Anonymity may have protected the hunter from the vicious social media lynch mob that has destroyed the lives of many other hunters before her, even when their hunts were perfectly legal in the countries in which they hunted, and in line with those countries’ sustainable use conservation strategies. But that didn’t stop celebrities like Naomi Campbell and Ricky Gervais from whipping up the mob against SCI and trophy hunters in general. Foreign celebrities and the wealthy, urban American and European elites they represent can hardly identify animals beyond the Big Five. They know nothing about the reality of wildlife conservation and its relationship with socio-economic development in Africa. Their emotional calls to ban trophy hunting, or ban hunting altogether, are ignorant and naïve. And although they probably mean well, heeding their calls will have severe repercussions for conservation in Africa. I should probably point out that I do not hunt. I also dislike trophy hunter photos. I could never shoot Bambi’s mother. However, I do not believe that my emotions on the matter should dictate government policy. For policy, we need to turn to pragmatism and reason. Take South Africa as an example. The country’s National Parks, as at 2017, cover 4.1 million hectares, which is about about 3.4% of the country’s total surface area of 122 million hectares. Another two million hectares are protected as state-run nature reserves. Some six million head of game are supported on this government-protected land. 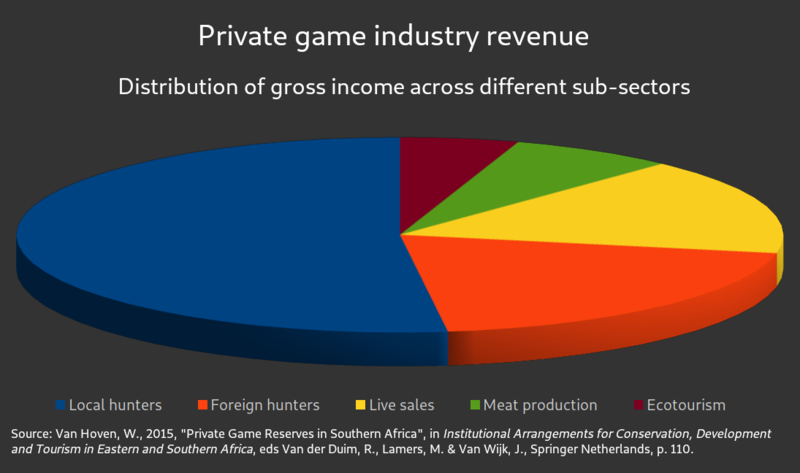 By contrast, South Africa’s private game industry consisted of 11,600 farms in 2015, adding up to 21-22 million hectares, according to Wouter van Hoven of the Centre for Wildlife Management at the University of Pretoria. This includes private game reserves primarily funded by tourism, private game ranches primarily funded by hunting, and private game farms primarily funded by the breeding and sale of game. That accounts for 18% of the country’s total land area, which is nearly four times the total state-protected land, and more than five times the area comprising National Parks. 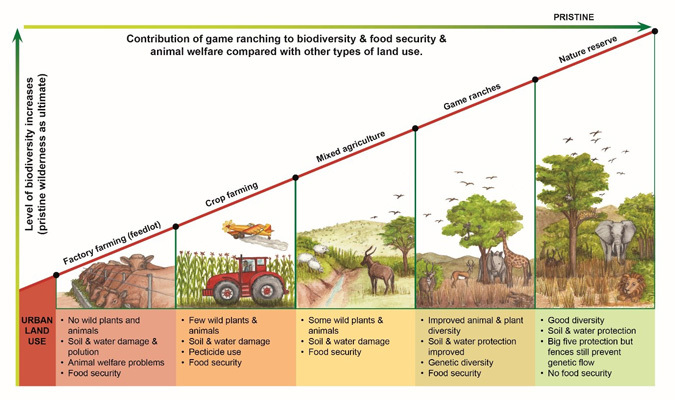 Given a game density of about one animal a hectare, which is a consistent figure in all estimates of land under game, that means the private game industry owns some 22 million head of game, in South Africa alone, which is almost four times the game protected in the country’s National Parks. Since private ownership of game was established in 1991, game populations have thrived in South Africa. Many big game species that were extremely rare made a dramatic recovery in numbers. National Parks support less than 500 sable antelope, 380 roan antelope and 1,000 bontebok. All are more rare than black rhino, which number 1,510 in National Parks. Today, private ranches, reserves or farms host 15,000 sable antelope, 4,500 roan antelope and 7,000 bontebok. Private owners account for 90% of all blesbok, 87.5% of all bontebok, 97% of all sable antelope, 92% of all roan antelope, and 87% of all the black wildebeest in South Africa. Private game ranches are not the be-all and end-all of conservation, of course. Although many agree to bring down fences between them to enlarge the areas accessible to game, most remain small and fragmented compared to the relative handful of large National Parks. That means far more active management is required on private ranches to maintain healthy ecosystems with a good balance between carnivores and herbivores, and between herbivores and plants. In 2016, the Endangered Wildlife Trust published a study of the private game industry in South Africa. It did not assess the value of ecotourism on private game reserves. It did attribute values to game meat production (R611.5-million), biltong hunting (R650-million), trophy hunting (R1.96-billion) and live sales (R4.33-billion). In 2013 the late environmental affairs minister Edna Molewa attributed revenue of R6.2 billion to the hunting industry, which is higher than the trust’s figures. Three researchers at North-West University, Phillipus Cloete, Petrus van der Merwe and Melville Saayman, put hunting revenue at R7.5 billion. Measured as revenue per hectare, the ranking of game industry sectors changes. According to the Endangered Wildlife Trust study, game meat results in revenue of between R37 and R42 a hectare, biltong hunting delivers R81 a hectare, live sales produce R202 a hectare, and trophy hunting yields R234 a hectare. Considering that more than half of live sales occur between private owners, it is clear that hunting plays a significant role in supporting the game industry. Proponents of hunting bans almost universally propose ecotourism as an alternative. However, most of the scenic and accessible areas where this can work are already dedicated to ecotourism. There are vast tracts of wilderness in Africa where tourists simply won’t go, because of their remoteness, lack of development or relative safety. An excellent example is the Bubye Valley Conservancy in Zimbabwe, which was converted from a huge, barren cattle ranch into a thriving nature and wildlife conservancy, supporting game up to and including the Big Five, and providing jobs and meat to local communities. It is supported exclusively by hunting revenues. It is no exception. Throughout southern Africa, ecotourism contributes only 5% to the revenue of the private game industry, according to Van Hoven. Meat production adds another 7%. Live sales make up 16% of revenue. And hunters account for a resounding 72% of private game industry revenue. It is certain that curtailing hunting revenue — by prohibiting trophy hunting or any hunting at all — will make many private game ranches unsustainable. They will be converted to crop farming, if possible, and livestock ranching on more marginal land. Millions of hectares that are now relatively intact wilderness, supporting millions of head of game, will disappear. Robin Naidoo, a senior conservation scientist at the Worldwide Fund for Nature (WWF), published a study in 2015 to compare the contributions of tourism and hunting to communal conservancies in Namibia. “A simulated ban on trophy hunting significantly reduced the number of conservancies that could cover their operating costs, whereas eliminating income from tourism did not have as severe an effect… [T]hese two activities together may provide the greatest incentives for conservation on communal lands in Namibia. “A singular focus on either hunting or tourism would reduce the value of wildlife as a competitive land-use option and have grave repercussions for the viability of community-based conservation efforts in Namibia, and possibly other parts of Africa,” Naidoo and his co-authors concluded. Note that these are not hunting industry arguments. These are arguments made by independent scientists and environmentalists, with no skin in the game other than their (presumed) interest in conservation. Banning trophy hunting, they argue, would lead to worse conservation outcomes for three reasons. This is a critical point. There are presently around 8,000 lions on private game ranches, compared with 3,100 lions classified as wild or “managed wild”. Thanks to the hunting industry, the number of lions in South Africa has risen sharply in the last two decades, while lion populations have declined by 60% elsewhere in Africa. The lion hunting industry could be subjected to an outright ban, or curtailed indirectly by prohibiting trophy transport or prohibiting the trade in products like lion bones. If that were to happen, however, most of the 8,000 privately owned lions would have no reason to exist. Therefore, they will cease to exist. And where will people get their lion bones from? Poachers, targeting the remaining 3,100 lions in National Parks, of course. That is exactly what happened when the trade in rhino horn was banned: previously negligible poaching numbers ballooned into an existential crisis for rhino. Rhino poaching numbers remain far too high, at more than 1,000 animals a year, even though the anti-poaching effort is a staggeringly expensive operation employing vast numbers of heavily armed rangers and military personnel and equipment. Finally, hunting farms are simply managed better than ecotourism facilities. “[M]anagement for hunting places emphasis on maintaining large wildlife populations for offtake, as opposed to ecotourism, where the presence of only a few individual animals is sufficient to maximise profits… Empirical evidence shows that the strategy of artificially managing small populations within electrified fences to maximise economic return from ecotourism and minimise management costs might be the most appropriate to enhance tourist experiences. In Kenya, a hunting ban was instituted in 1977. There is no commercial hunting in Kenya. Despite this measure — and some would say because of it — the country has lost almost 80% of its game to poaching. Defenders of the hunting ban argue that population growth and economic expansion, with its higher demand for farmland, was the primary cause of the precipitous decline in wildlife. But that is just a roundabout way of saying that keeping land under game had less value than turning rangeland into crop or livestock farms. When wildlife has little or no commercial value, it doesn’t pay to protect it. Kenya has had some limited success with private wildlife conservation, but a 2009 study on the subject points out that the country’s hunting ban is significantly limiting management and revenue options for landowners. By contrast, it reports that hunting has been used successfully to support wildlife conservation in other African countries, and in nine such countries land under private conservation exceeds land in parks and other state-protected reserves. In Botswana, wildlife hunting was banned under former president Ian Khama, who had strong environmentalist feelings. Soon, however, reality began to set in. Local communities were devastated by the loss of the hunting industry, not only because of the revenue, jobs and meat it used to provide, but also because wild animals were now no more than pests. In the wake of the discovery of 90 poached elephant carcasses earlier this month, Botswana is considering whether to lift its hunting ban. In Zambia, a 2013 ban on hunting big cats was lifted two years later, because it curtailed funding for sustainable wildlife programmes, and harmed local communities. “We hope and trust that the hunting of big cats will be an integral part of sustainable harvesting of wildlife resources,” Nyambe Nyambe, country director of the WWF in Zambia, told the BBC. Some scholars oppose private ownership of wilderness entirely, no matter whether it is used for ecotourism, game farming or hunting. They argue, with some justification, that this has resulted in denial of access to agricultural land to local communities. “There is an irony in the fact that, in this instance, the conversion to wildlife production in post-apartheid South Africa achieved what the apartheid government was never able to do — that is, to expel black labour tenants from white-owned farmland and created a racially purified space,” Dutch researchers observed about relocations of people to establish a private game reserve in northern Kwazulu-Natal. Access to land for the poor, and achieving racial representivity in land ownership patterns, are burning issues in South Africa right now. So perhaps there is political merit in converting privately owned land under game in South Africa to communal agriculture. At least it would put the demands of the African people ahead of the desire among Western elites to preserve their fantasy of an idyllic, unspoilt, pastoral Africa. Of course, that fatally undermines not only conservation, but also private property rights. But then, the wealthy armchair-dwellers who like to patronise Africans about conservation matters are often disenchanted with the notion of private property anyway, except inasmuch as it concerns their own. So they can kill two birds with one stone: enable a popular agrarian revolution, and do away with private, for-profit wilderness and game conservation by greedy, capitalist “green-grabbers”. It’ll be a great win for world socialism, although millions of head of game will die for it. Ivo Vegter is a columnist and the author of Extreme Environment, a book on environmental exaggeration and how it harms emerging economies. He writes on this and many other matters, from the perspective of individual liberty and free markets. He is seldom wrong.